Urethral catheterization is a routine medical procedure that facilitates direct drainage of the urinary bladder. It may be used for diagnostic purposes (to help determine the etiology of various genitourinary conditions) or therapeutically (to relieve urinary retention, instill medication, or provide irrigation). Catheters may be inserted as an in-and-out procedure for immediate drainage, left in with a self-retaining device for short-term drainage (as during surgery), or left indwelling for long-term drainage in patients with chronic urinary retention. Patients of all ages may require urethral catheterization, but those who are elderly or chronically ill are more likely to require indwelling catheters, which carry their own independent risks. 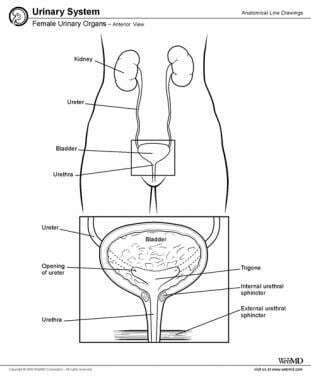 The basic principles underlying urethral catheterization are gender-neutral (see Urethral Catheterization in Men), but certain aspects of the procedure require particular attention in the female urethra. The developed female urethra is a 4-cm tubular structure that begins at the bladder neck and terminates at the vaginal vestibule (see the image below). It is a richly vascular spongy cylinder and is designed to provide continence. Female urinary organs, anterior view. The female urethra is suspended by the urethropelvic ligament with its 2 sides (the abdominal side being the endopelvic fascia and the vaginal side being the periurethral fascia). The female urethra pierces the pelvic diaphragm and the perineal membrane just posterior to the pubic symphysis. Distally, it exhibits more genital characteristics, becoming rich in glands and developing a squamous epithelium. For more information about the relevant anatomy, see Female Urethra Anatomy. See also Female Urinary Organ Anatomy and Bladder Anatomy. Traumatic injury to the lower urinary tract (eg, urethral tearing) is a contraindication for urethral catheterization in women. Suspected bladder injury is not a contraindication to placement of a urethral catheter. A urethral catheter allows drainage of urine from an injured urinary bladder and provides a route for contrast administration during cystoscopy. Extraperitoneal urinary bladder injuries are usually treated conservatively with an indwelling catheter, whereas intraperitoneal urinary bladder injuries usually call for operative repair. A larger than standard catheter should be used when the indication for placement is continuous bladder irrigation for hematuria and clots. A 3-way catheter (with an additional port) is often used in conjunction with a large-volume reservoir to create a “Murphy drip” for continuous irrigation. Prophylactic antibiotics are recommended for patients with a prosthetic heart valve or an artificial urethral sphincter. Consider suprapubic catheterization if vaginal hygiene is impaired. Ortega R, Ng L, Sekhar P, Song M. Videos in clinical medicine. Female urethral catheterization. N Engl J Med. 2008 Apr 3. 358(14):e15. [Medline]. van den Broek PJ, Wille JC, van Benthem BH, Perenboom RJ, van den Akker-van Marle ME, Niël-Weise BS. Urethral catheters: can we reduce use?. BMC Urol. 2011 May 23. 11:10. [Medline]. [Full Text]. Doherty W. Instillagel: an anaesthetic antiseptic gel for use in catheterization. Br J Nurs. 1999 Jan 28-Feb 10. 8(2):109-12. [Medline]. Wong ES, Hooton TM. Guideline for Prevention of Catheter-associated Urinary Tract Infections. http://www.cdc.gov/ncidod/dhqp/gl_catheter_assoc.html. Centers for Disease Control and Prevention Web site. Available at http://www.cdc.gov. Accessed: July 10, 2009. Tanabe P, Steinmann R, Anderson J, Johnson D, Metcalf S, Ring-Hurn E. Factors affecting pain scores during female urethral catheterization. Acad Emerg Med. 2004 Jun. 11(6):699-702. [Medline]. Kunin CM. Urinary-catheter-associated infections in the elderly. Int J Antimicrob Agents. 2006 Aug. 28 Suppl 1:S78-81. [Medline]. Suskind AM, Smith PP. Evidence of a functional effect of transient transurethral catheterization on micturition in women. Int Urogynecol J. 2012 Jan 17. [Medline]. Hollingsworth JM, Rogers MA, Krein SL, Hickner A, Kuhn L, Cheng A, et al. Determining the noninfectious complications of indwelling urethral catheters: a systematic review and meta-analysis. Ann Intern Med. 2013 Sep 17. 159(6):401-10. [Medline]. Preparatory solution in commercial urinary catheterization kit. Urinary catheterization kit. Image courtesy of Michel Rivlin, MD, and G Rodney Meeks, MD. Urinary catheterization supplies. Image courtesy of Michel Rivlin, MD, and G Rodney Meeks, MD. Urinary catheter tip. Image courtesy of Michel Rivlin, MD, and G Rodney Meeks, MD. Urinary catheter urine collection bag. Image courtesy of Michel Rivlin, MD, and G Rodney Meeks, MD. Urinary catheterization. Video courtesy of Michel Rivlin, MD, and G Rodney Meeks, MD. Taping of urinary catheter. Video courtesy of Michel Rivlin, MD, and G Rodney Meeks, MD. The authors and editors of Medscape Reference gratefully acknowledge the assistance of Lars Grimm with the literature review and referencing for this article. They also thank Michel Rivlin, MD, and G Rodney Meeks, MD, for the videos and several of the images in this article.